Happy Saturday Gypsy Soul Laser Cuts Fans!!! Today I am sharing my Clean and "Simple" Spirited Card Set using some amazing GSLaser Cuts Chippies!!! To begin by first painting the back of the four pieces of the Stackable Labels Shape Set with Carbon Black paint. Emboss background paper; adhere to card base with pattern strip of paper to the bottom of the card base. Adhere a strip of "diamonds that has been cut from the Diamond Texture Sheet; adhere to top of card. Adhere prepared labels to front of prepared card bases. Spatter front of cards with paint; dry. 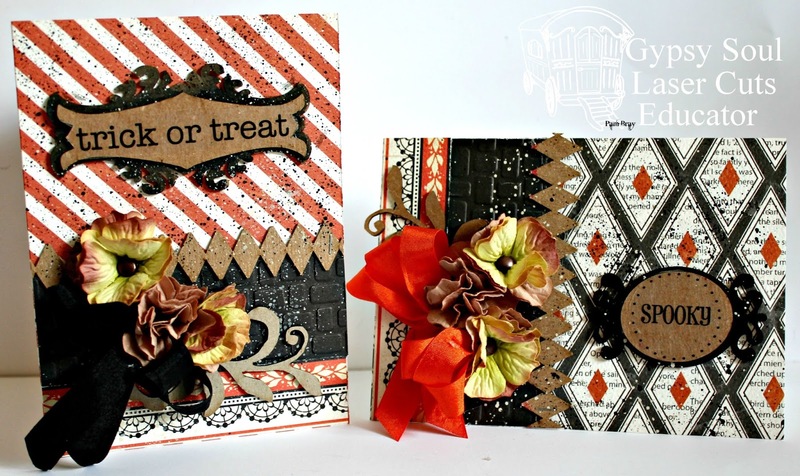 Place SRM Halloween Stickers to front of the matching labels from the Stackable Labels Shape Set. Adhere prepared labels to front of cards. Adhere Flourish Miniatures to bottom of card. Make and adhere bows and flowers to place on front of cards.